Xi'an is the starting point of the Silk Road, and is located in the Wei river valley on the southern bank of the Wei River. The largest city in northeast China, it is the political, economic, and cultural center of the province of Shaanxi. Xi'an once vied with Rome and later Constantinople for the greatest city in the world. Over a period of 2,000 years Xi'an has seen the rise and fall of numerous Chinese dynasties. Xi'an was the capital for 13 dynasties - over 1,000 years. 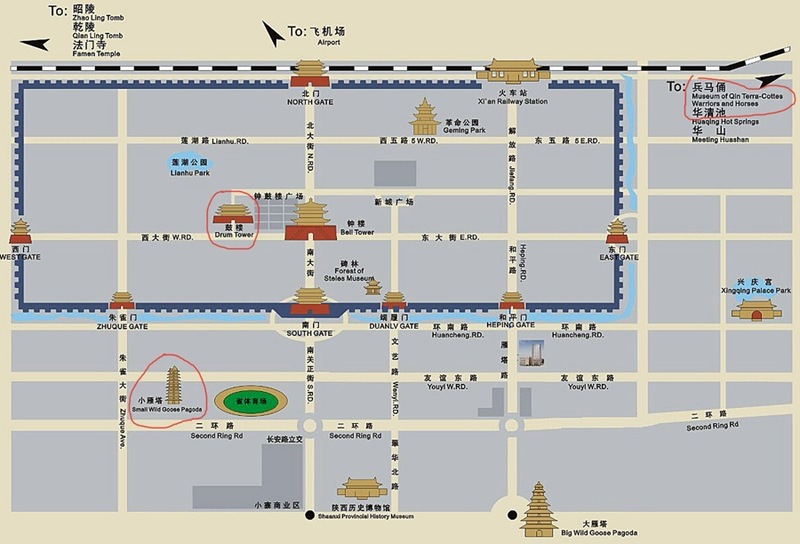 Monuments and archaeological sites in the city and surrounding plain are a reminder that once upon a time Xi'an stood at very center of the Chinese world. When ancient Peking (now Beijing) was just a remote trading post, Xi'an was the capital of the Middle Kingdom and one of the world's biggest and richest cities, the geographical beginning of China's fabled Silk Road. The earliest evidence of human habitation in the Xi'an area dates back 6,000 years to Neolithic times, when the then lush plains proved a perfect area for primitive Chinese tribes to establish villages. In time, the legendary Zhou established a capital on the banks of the Fen River near present day Xi'an. In 221 BC, Emperor Qin Shi Huang unified China and established his capital at Xian Yang, near present day Xi'an. His longing for immortality gave posterity a remarkable legacy: a tomb guarded by thousands of terra cotta soldiers. Xi'an was called Chang'an under the Tang Dynasty (618-907 AD), and with 2 million inhabitants, it became the largest city in Asia, if not the world. It attracted courtiers, merchants, foreign traders, soldiers, artists, entertainers, priests and bureaucrats, and helped China embark on a brilliant period of creativity. Xi'an is one of the few cities in China where the old city walls are still visible. The walls were built on the foundations of the walls of the Tang Forbidden City during the reign of Hong Wu, first emperor of the Ming dynasty. They form a rectangle with a circumference of 14 km (over 8 miles). On each side of the wall is gateway, and over each stand three towers. At each of the three corners is a watchtower, their tops punctuated with defensive towers. The wall is 12m high, with a width at the top of 12m to 14m and at the base of 15m to 18m. Built in huge, classical Chinese style, the museum was opened in 1992 and is rated as one of the best museums in China. The collection is chronologically arranged; many objects have never been on display before. It was built in 652 A.D. to house the Buddhist scriptures brought back from India by the traveling monk Xuan Zang, who then set about translating them into 1335 Chinese volumes. The first college in China was set up during the Han dynasty (about the time of Christ). It is now a museum which Arthur visited in 1979 and bought a rubbing of a stele. We went to visit the Qin Mausoleum. Qin's reign began in 221 BC, and you might call him the great-grandfather of China, since he created it by unifying many small kingdoms. Construction of the mausoleum began when Qin Shi Huang (259-210 BC), First Emperor of the Qin Dynasty, was enthroned at the age of 13. It was completed 38 years later. 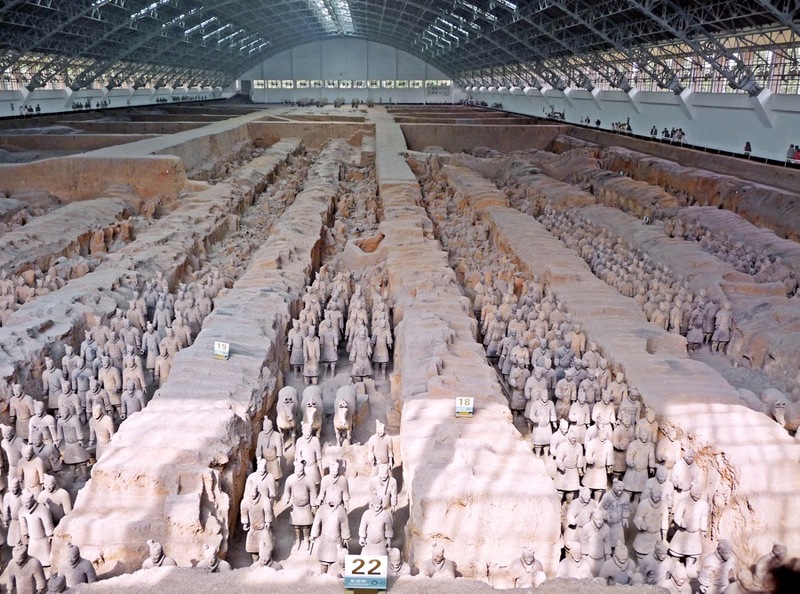 At his death more than 2,000 years ago, the Emperor Qin Shi Huang was buried in an earth mound, along with 6,400 life-sized terra cotta warriors, archers, and infantrymen, together with their horses and chariots, all individually sculpted from live models. His mausoleum was built in the shape of the old capital, Xi'an, and the terra cotta warriors were all outside the tomb's city-wall's east gate. It took 780,000 people 36 years to construct the tomb. So far three pits have been excavated, bringing to light a vast army of terra cotta warriors, complete with weapons and horses. The Terra Cotta Warriors of the Qin Mausoleum were discovered accidentally by a farmer, Mr. Yang Zhi Fa, who was digging an irrigation well in 1974, and found some pottery fragments and ancient bronze weapons. The Terra Cotta Warriors became one of the greatest archeological treasures in the world. Three large pits have been uncovered, and are now on view to the public. Walkways have been constructed to give you a bird's-eye view of the stunning sight of an entire army carved in incredible detail, with each man and each horse carved with its own distinct personality. They stand in battle formation, set in the ground to guard and protect the great emperor's tomb. Archaeologists have uncovered over 7,000 life size figures in the vault, grouped in the battle order, rank by rank, some mounted in horsedrawn chariots, others in infantry groups armed with spear, swords, and crossbows. It turned out to be one of the greatest archaeological finds ever. No one knows how many warriors there are, but Pit 1 contains about six thousand, over a thousand of which have been restored. Each of the warriors has a unique face and appearance, suggesting that they were each modeled after an actual warrior. In 1980, archaeologists discovered a large pit containing two sets of painted bronze chariots and horses, broken into thousands of pieces. Their restoration took eight years. They've even found a bronze crane with a bronze worm in his mouth! The mausoleum faces east and, with a mound of approximately 140 feet high, it includes an inner and an outer wall, with a number of attendant burial pits. According to the Records of the Historian the emperor's coffin rests on a base cast with copper. Mercury and pearls are used to represent rivers, the sun and the moon, wild game and trees, symbolizing the heaven and earth. There are also palaces, towers and pavilions, and seats for various officials. The door of the burial chamber is equipped with automatic crossbows to prevent it from being robbed. All those who had been employed as workmen or craftsmen, as well as court maids, who had been in the funeral procession, were buried alive in the tomb alleys. Pit #1, at the East Side of the Mausoleum is the largest with over 6000 figures arranged in military fashion. Fire and structural damage had shattered the clay army; therefore, most of the warrior had to be rebuilt. Pit #2 was discovered in 1976, and is an L shaped chamber of smaller dimensions containing over 1400 chariots and cavalrymen. Four basic units have been distinguished; a vanguard of archers with unarmored striding infantrymen, two units of cavalry and chariots, and a further unit of cavalry and chariots divided into eight corridors. Pit #3, was excavated in 1977. It is, a small chamber, only 1/7th the size of first pit. Its figures appear to represent an elite command force. Pit #4, was discovered, but is empty, suggesting that the work was abandoned before completion, perhaps due to the sudden death of the emperor in 210 BC and the fall of the dynasty. The ground plan of the mausoleum suggests the layout of an ideal imperial city, the inner part representing the emperor's "Forbidden City" and the outer part, the periphery. 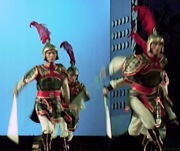 The guards of the capital during the Qin dynasty could be divided into the imperial bodyguards who stood guard in the court and the garrison troops who protected the capital. The terracotta army was not mass produced from molds. Each figure was individually modeled. Heads, arms and bodies were modeled separately and then joined with strips of clay. The bodies are hollow and made up of coiled earth and attached to solid legs. A cross section of a broken warrior showed that a rough model was made first, then a fine clay slip was added, and details such as eyes, mouth, nose and details of dress were carved into the clay while it was still pliable. Additional pieces such as ears, beard and armor were modeled separately and attached. The whole figure was fired in a pottery oven later. 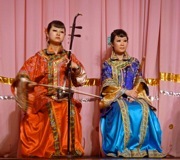 The hair was carved elaborately and shows many distinctive styles and a great variety of topknots. The horses were made in a similar fashion. The large round plugs on each side of the body fill holes that served as vents during the firing. Each horse was equipped with a bronze bridle. The warriors and horses were originally painted with bright colors. There were two main color schemes used for the armored warriors. Uniforms further distinguished the role of each figure, and colors may also have indicated different regimental units. The colors on the horses are very poorly preserved, but they seems to be black or brown with white hooves and teeth, and red inside their ears, mouths and nostrils. 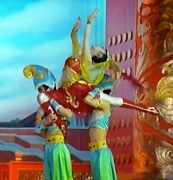 The Qin army shows at least seven different styles of armor. Tassels and ribbons represented badges of rank, as well as ornate headgear with double folds and ribbons. The unarmored vanguard of Pit 1 wears light clothing to facilitate fast movement, and they use long range bows to avoid close combat. Infantry squads wielding long lances, which would prevent the horses from being killed, guard the chariots. Two of the six chariots in Pit I carry drums and bells, which would have sounded orders to advance or retreat. The spearmen were also lightly equipped. No two faces of the Qin warriors area alike, and anatomical details such as eyes and mouth are surprisingly lifelike. The fact that the warriors show varying physical features of minority nationalities from the far reaches of the Empire, reflects the vast number of conscripts that made up the First Emperor's army. This monumental scale, grandiose conception and the sheer numbers of China's underground army testify to the imperial vision and power of the emperor who is said to have led a million armored soldiers, a thousand chariots and 10,000 horses to conquer and gloat over the world." The whole array breathes the power and grandeur of Qin Shi Huang's army, which conquered six other ducal states and the Hun tribe. After visiting the tomb, we went to the house of a local family for a home-hosted lunch. The kids in the family were especially taken with the photos and notes we brought from the kids at the Daly City Primary School. The “air pollution” is due to winds carrying dust from the Gobi desert. Most people in China like hard beds. 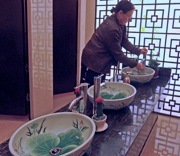 The older people and farmers especially like super hard pillows made of jade or stone. For proper ying-yang balance you want your feet warm and your head cool. Then we visited the Houkou Primary School, in Bagiao District, in Xi'an City, in Shaanxi Province, a community-founded school that is supported in part by the Grand Circle Foundation. We took pictures of the kids who were there to take back to the Daly City primary school. I hope they will be able to set up some penpal relationships. Professor Tai said that they are now discussing a requirement of 12 years of schooling, but he thinks that China can't afford it at this time. In the Beijing and Shanghai regions, 25% of the children pass qualifying mark for university, but that mark is higher for small towns, In Qu Yi's home town only 12-13% passed the higher mark required to go on to university. 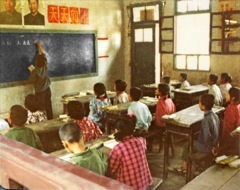 Before Mao, education was onbly for the very rich. Mao changed that and built some schools for all, but he didn't value education either, He more valued the country farmers. Well educated and low-educated people received the same pay, so few parents wanted to send their kids to school. The Cultural Revolution meant 10 years of disaster. Teachers were sent to the countryside to be farmers. The Cultural Revolution was sort of a scandal. Parents won't talk about that time, and the time is not spoken of in histories and books. At that time people were required to memorize and recite all parts of the Little Red Book every day, If you couldn't recite it when you were stopped on the street, you were put in jail as an enemy of the country. You were also required to wear a badge of Chairman Mao. 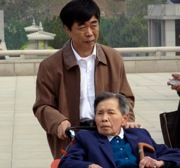 During the Cultural Revolution Mao said that everything old should be thrown out and replaced with new. The Red Guards burned old books, destroyed monuments and old buildings, and teachers were put at the bottom of society. 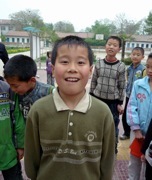 Qu Yi only had a part-time teacher because there were so few teachers that schools had to share them. 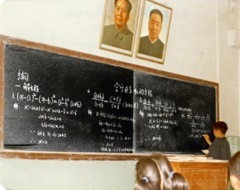 After Mao died, compulsory 9-year education was reinstated. 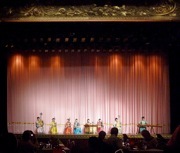 That night we went to the Xi'an opera to have dinner and watch a performance. They were terrific. 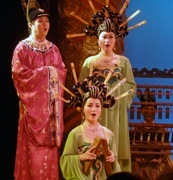 One of the musicians was especially good with the Chinese flute.